A piece of Newfoundland's fishing history sailed through the Narrows into the St. John's harbour on Thursday morning. A piece of Newfoundland's fishing history sailed through the Narrows into the St. John's harbour Thursday morning. The Santa Maria Manuela is one of two remaining tall ships from the famed Portuguese White Fleet. Cod fishing on the Grand Banks was an integral part of the Portuguese economy for hundreds of years. While the fleet docked at outports around the island, St. John's was the main port of call. The stately vessels were regular visitors to the city until the 1970s. 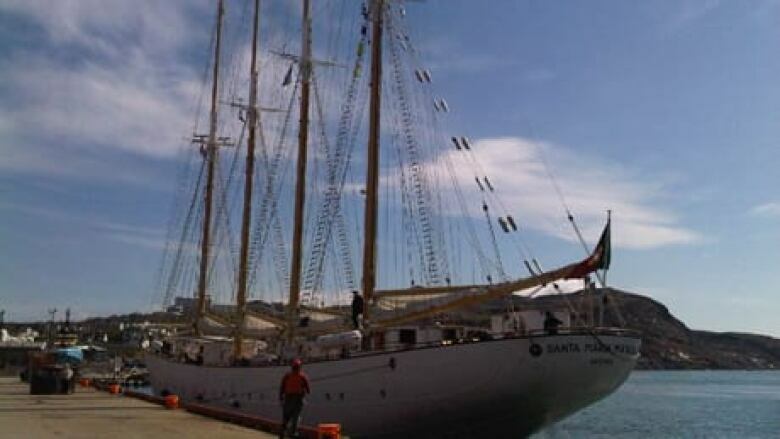 Jean–Pierre Andrieux, a friend of the Portuguese family that owns the Santa Maria Manuela, says they've restored the four-masted ship to its original form. "As a method of preserving the history of their family, they decided to buy the hull of this vessel, which was to be scrapped probably, to redo it at a cost of eight million euros, about $12 million," said Andrieux. The Santa Maria Manuela will be docked in St. John's and open to the public through the holiday weekend.